Life in North Korea is the result of a seventy-year social experiment that started out with the intention of shielding people from the corrupting influence of the outside world. And so every day from Monday to Saturday about 24 million people work obediently to maintain the social experiment alive within a political regime that keeps them isolated and subjugated. Their leader, Kim Jong-un, inherited the power from his father. Although North Korea is slowly opening up its doors to foreign investors, many things still remain a mystery to the outside world. However, Koreans seem to be proud of their political system because they believe that the world is too unstable. Behind their walls they feel safe, like a big family. At least that’s what they say on camera. For some, this loyalty comes as a result of receiving gifts from their supreme leader. One biologist received the keys to a 240m furnished apartment as a token of gratitude for the research he has done. Farming is a way of life for many North Koreans. They work on collective farms where every morning loud speakers belting out words of encouragement or rousing music welcome them. The farmers are proud and dedicated to their work because they believe that their leader loves them and is always looking out for their good. It doesn’t matter how small the contribution might be, workers feel that by doing their best they are expressing gratitude for all that Kin Jon-Un has done for them. Even students pursue the same goal of serving their country. The exact amount of prisoners in the penitentiary system is also kept secret, but the way in which they are punished is quite different to most of the world. The political regime doesn’t believe that prisoners should be kept in cells where they can take drugs and plan more crimes. Instead, they are made to do compulsory labor or community service. The idea is that they give back to society what they have taken from it. So camps, fields, construction sites, and mines are the common destinations for prisoners that have been sentenced to punitive labor. High treason and insurrection carry the death penalty. 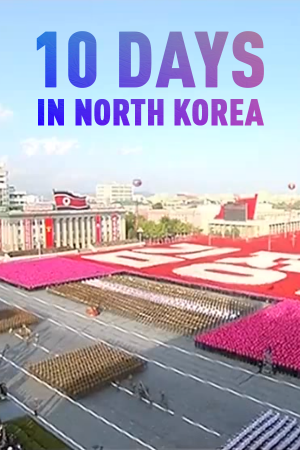 Most men in North Korea have to serve ten mandatory years in the military. This means that there are over a million soldiers in the regular army, not including the highly militarized police force. The military training begins at a young age and the army is seen as a source of inspiration and order. This is a society based on military ideology – a society that is constantly on combat alert. Excessive attention is paid to order, symmetry, and cleanliness in the capital city streets. The State prescribes what citizens are allowed to hear, see, and read. All outside music and fashion are censored, although they’d rather refer to it as ‘blockage’ to prevent the loss of their socialist ideology. Watch this film now.